Once Upon a Learning Adventure: Meet the Teacher Monday! 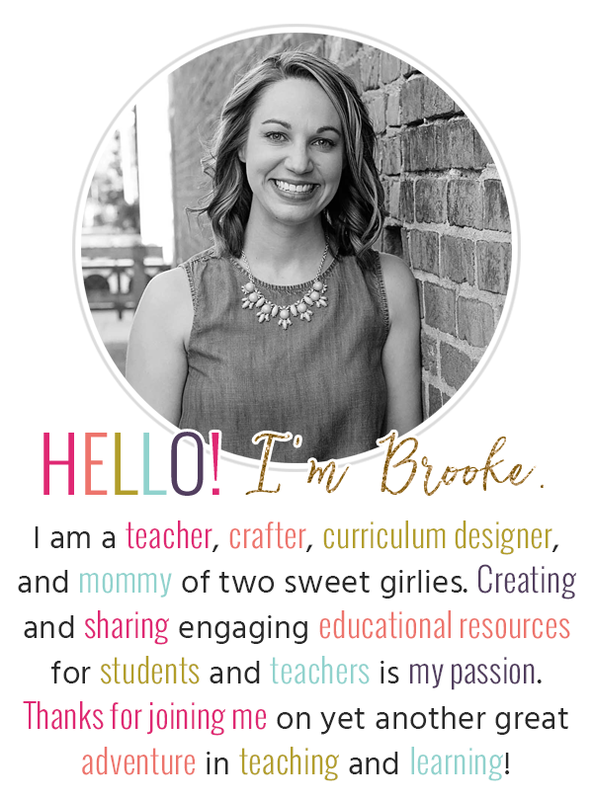 I'm linking up at Blog Hoppin' for Meet the Teacher Monday! Head on over to check it out! My name is Brooke. I've been married to my wonderful husband and best friend for four years, but we've been together for ten--He was my high school sweetheart and my very first date. We have a sweet baby girl named Elliotte who was born this past February, and we've also got two furbabies, Sampson and Sophie. This is my fifth year teaching--I've been in first grade from the start, and I love it! I was a cheerleader and a golfer in high school and a bowling state champ in elementary school. I only played softball one year (in 3rd grade) and have very (I mean VERY) little athletic ability, but I recieved a local softball organization scholarship my senior year. My family and friends still like to tease me about that. I was out on maternity leave for twelve weeks last year, so this year I'm excited to have a full year of teaching ahead of me! This will be my first full year using the Daily Five and Reading and Writing Workshops, and I cannot wait to see how they all impact my students' learning when used every single day (I used each of them last year and for part of the year before, but not consistently). I also love building community with my new students and teaching them to read. I love the excitement as that lightbulb turns on and they start to really grow as readers! This year, I am looking to improve in a couple of areas. First, I would like to include more small group instruction and differentiation in my teaching. This is why I'm really looking forward to starting math workstations! Also, I am hoping to improve my time management this year-- I have a new baby to spend time with (and my dh, too! ), so I'd love to find a better balance between school time and family time. Mavalus Tape - I have all cinder block walls--I have used six rolls since summer started! 3M Hooks and stickies - I use these to hang all of my pocket charts and my clothesline that goes around the classroom! Post-it Notes - Love them for workshop time! My Personal Laminator - It is so much more durable than the school's laminating. Avery Labels- I love to organize, and labels are definitely my friend! Books, Books, and More Books! I love them and am so thankful my sweetie lets me have a book allowance each month!